Allow me to complain for the fifty millionth time about my skin type: it could make an absolute mint in oil production yet I get flaky patches that are drier than the Sahara. This presents a serious challenge for skincare products to contend with – anything that I put on my face needs to hydrate the dryness without exacerbating the oiliness. My main concern is with the oiliness, particularly in the summer as I suffer with nasty sweating around the hairline (I know I know, gross right?). 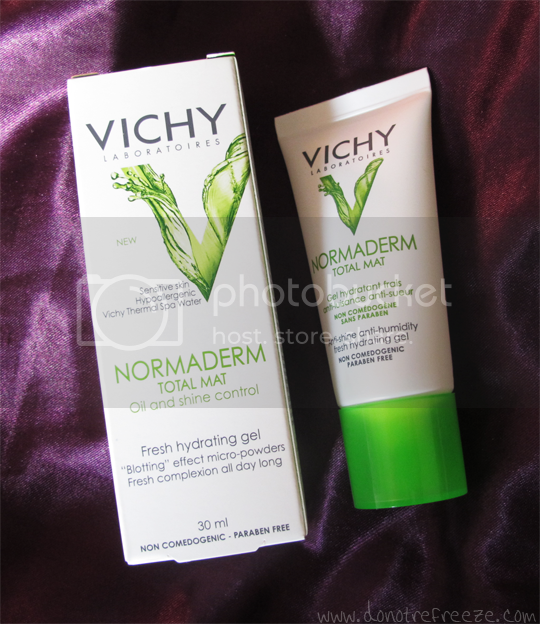 This made me particularly interested in the claims of Vichy Normaderm Total Mat*, a light and fresh gel moisturiser that aims to soak up excess sebum, oils and even sweat. I’ve never heard of an anti-sweat moisturiser before, and if it was any other brand I would be concerned that something which actually absorbs sweat and oil would clog my pores but you’re always safe with Vichy, thanks to their paraben-free and non-comedogenic formulas. That’s a word I learnt recently, non-comedogenic – just means it won’t clog your pores! Perlite is the secret ingredient in Total Mat, a naturally occuring volcanic molecule with a high absorption rate. It all sounds very nice, but how does it actually perform? Well, I have to say, rather bloody well. I’ve been using it as my morning moisturiser and makeup primer – you can instantly see the mattifying effect when you apply it (although I can’t imagine the effect would be so dramatic if your skin’s not as visibly oily as mine), and it does make a lovely base for makeup as it leaves a nice semi-matte finish. The light gel formula feels gorgeously fresh on the skin and does keep it hydrated – and the oil control is quite frankly a miracle. I do start looking shiny through the T-zone area after about 6 hours but nowhere near the level I usually do and honestly, I’ve never achieved that before with anything so you can colour me well and truly impressed. I’ll be really interested to see how it fares when the weather gets warmer again and the dreaded sweaty hairline returns. This comes totally recommended from me if you suffer from oily skin and shininess. The best value I’ve seen it for is from Boots at £12.50 for 40ml – which is an absolute steal for a product that really, really works. Yep, I’ll be popping over to Westfield on my lunchies to grab this bad boy. I am so glad you reviewed this. A few months ago I was looking for this here in the states @ Ulta and CVS, but they did not have it. I heard great reviews on this. Like you I suffer from oily skin and it’s a real pain trying to control it every which way possible. I’ll definitely keep an eye on this and purchase it when possible!